This White Hawk travel trailer is a wonderful addition to any family who is looking for an RV that delivers style and reliability. 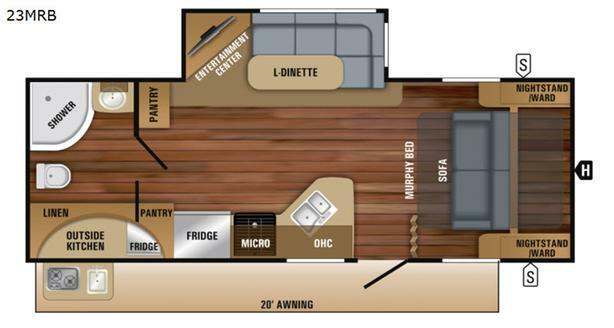 The residential appliances allow you to cook and store dinner with ease, and in this unit, you aren't restricted to only cooking dinner indoors because you can take the entire party outside of the trailer to the outdoor kitchen. After a long night of fun underneath the 20' electric awning, you can rest comfortably indoors on the Murphy bed with the Jayco-exclusive Simmons mattress. Jayco has made certain that you will stand out from the crowd while traveling in the White Hawk by adding their Magnum Truss Roof System which can withstand up to 4,500 pounds, fifty percent more than the competition. The American-made Goodyear tires with self-adjusting electric brakes are the perfect base to the sleek and aerodynamic exterior. On top of all of that, the entire trailer is backed by the Jayco 2-year limited warranty so that you can travel with confidence during every adventure you take.